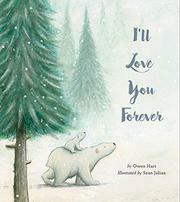 A polar-bear parent speaks poetically of love for a child. A genderless adult and cub travel through the landscapes of an arctic year. Each of the softly rendered double-page paintings has a very different feel and color palette as the pair go through the seasons, walking through wintry ice and snow and green summer meadows, cavorting in the blue ocean, watching whales, and playing beside musk oxen. The rhymes of the four-line stanzas are not forced, as is the case too often in picture books of this type: “When cold, winter winds / blow the leaves far and wide, / You’ll cross the great icebergs / with me by your side.” On a dark, snowy night, the loving parent says: “But for now, cuddle close / while the stars softly shine. // I’ll always be yours, / and you’ll always be mine.” As the last illustration shows the pair curled up for sleep, young listeners will be lulled to sweet dreams by the calm tenor of the pictures and the words. While far from original, this timeless theme is always in demand, and the combination of delightful illustrations and poetry that scans well make this a good choice for early-childhood classrooms, public libraries, and one-on-one home read-alouds.